Students taking Critical Making: Information Studies, Social Values, and Physical Computing, taught by Professor Matt Ratto showcase their final projects at the Critical Making Show. This course focuses on critically exploring social issues in technical systems, acquainting students with possible problems of new physical and ubiquitous information technologies, and helping students develop skills in designing, making and evaluating information systems that use these new technologies. 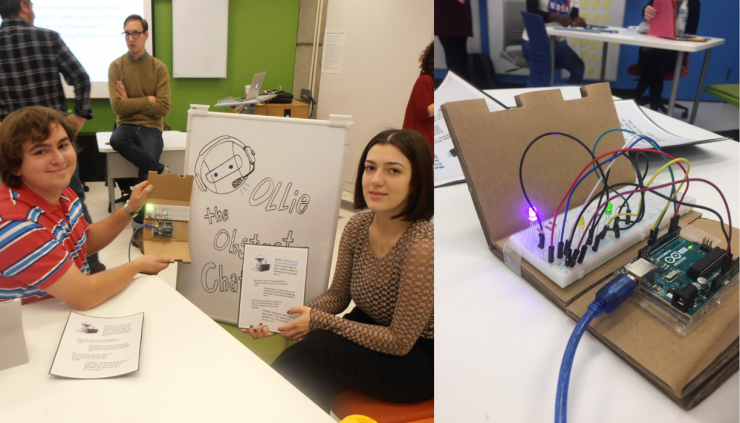 Two students in this class, Jessica Baldanza and Anton Grishyn, created “Ollie, The Obstinate Chatbot” which replicates similar chatbots one might encounter online. For instance, when you are chatting to customer service or tech support over a website, there is a good chance you are speaking to a chatbot. Since Chatbots are so common and only getting better at engaging with human speech, it is increasingly difficult to know whether you are speaking to a person or chatbot. “Ollie” has been infused with some humanlike qualities to ease the flow of conversation. Jessica and Anton made a fun, interactive project to help demystify the chatbot phenomenon for its user by way of a step by step program. In this case, the user is invited to use “Ollie” to turn on a green light connected to the program, in order to do this, one must find the keywords the chatbot recognizes and connects to this action. The chatbot is driven by an algorithm which recognizes and replies to specific words based on the text the user inputs. The point of the project is to get people to think about chatbot logic and its reliance on keywords. The demystifying comes from drawing attention to the keywords “Ollie” has been programmed and reply to and notice. Scripting the entire conversation the user can have with the chatbot is challenging because you have to consider every response from the chatbot based on what the user would say. Given the prevalence of chatbots these days, familiarizing users with chatbot logic can help ease encounters with them or navigate your way around them out in the virtual world. Jessica Baldanza is a graduate student at the Faculty of Information in the Archives and Culture & Technology streams at the University of Toronto. Anton Grishyn is a graduate student at the Faculty of Information in the Critical Information Policy Studies and Culture & Technology programs at the University of Toronto.